Mission: Impossible fans are busy updating their rankings after seeing Fallout, the sixth installment in the series. Style – How good does it look? Is it dated or will it be? How well does he pull it off? Upkeep – How hard is it to keep looking good? Spoiler alert – Tom Cruise has great hair. Style – Young Ethan went with a much closer cut on the side with a slightly longer, but neat look on top. Easily his cleanest cut, but also his most boring. Practicality – With so little hair it doesn’t lend itself to re-styling if he wants to go incognito, unless he wanted to hide in a ’90s boy band. Also, it makes him look like a narc, which is bad when you’re a secret agent trying to blend in. Upkeep – Minimal. Probably doesn’t even need to comb it most days. How It Looks During The Movie’s Biggest Moments – Insignificant. During his iconic drop from the ceiling it doesn’t help or hurt the scene, and it’s too short to add any flair to the helicopter in the tunnel sequence. This is the hair of an FBI agent who knocks on doors, not a super cool world class spy you never see coming. It certainly fits the time period, but it hasn’t aged that badly, especially if you just graduated from the police academy. Style – Flowing locks in the front, back, and along the side, which he primarily brushes out of his face and across his head. This is the hair of a popular music producer with many Grammy awards. Practicality – More hair means an easier transformation, but the long bangs means always dealing with hair in your eyes during high pressure situations. Upkeep – With this much volume for such a long cut you really gotta commit. You have to condition, you have to have the right kind of comb, and you have to want it, which he obviously does. The better question is how does he find the time? How It Looks During The Movie’s Biggest Moments – Ethan’s insane climb outside the building in Dubai, and his run through the sandstorm wouldn’t be nearly as good if his flowing locks weren’t reminding us of the environmental dangers of the job. You really feel the air! 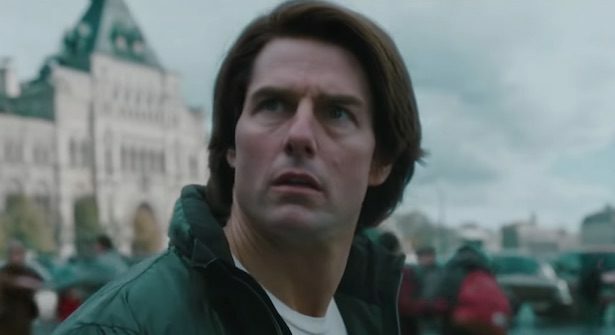 Tom Cruise is aging like an Asgardian and will still look good at age 400, but this is the one Mission: Impossible where his hair seems a little too young for him relative to his other Ethan haircuts. He still pulls it off for the most part, it’s just that at certain points his hair screams midlife crisis. Since he wasn’t trying to infiltrate an Amish terrorist ring that’s probably the worst Ethan Hunt’s hair has ever looked. Style – Shorter on the sides, only slightly longer on the top, but still neat and timeless. Practicality – Not much you can do with this to alter your look, but such a classic cut it wouldn’t stand out in any way. Upkeep – Very manageable, though to look its best it still needs to be brushed. How It Looks During The Movie’s Biggest Moments – The interrogation/countdown scene is one of the best in the franchise, and you would not want any hair hiding Ethan’s expressions as he freaks out and pleads for “Julia’s” life. In a vacuum, this isn’t as good a look for Ethan as his longer hair in Ghost Protocol, but relative to the time periods in his life this better suited him. He could go back to this at anytime and still look okay no matter the situation, but his hair in Ghost Protocol looks good when he is active, not while he is stationary. Style – Ethan’s most hybrid look, because it’s the happy medium between his longest and shortest cuts. Practicality – It’s also his most versatile look. He can restyle it if need be, or do nothing and simply get lost in a crowd. Upkeep – When you’re running all over the world and going from arid environments to humid ones quickly, you can’t always maintain this kind of volume naturally, so he must stay on top of it. How It Looks During The Movie’s Biggest Moments – Oh, you mean when Tom Cruise hung outside of a plane? Yeah, it makes his hair look incredible. A shorter cut would have been a huge letdown. It’s insane this hair only comes in third, but that’s a testament to the top two looks. Let’s quickly talk about his two other haircuts that briefly appear in this movie. The first, a wavier look that isn’t dramatically different from what we see later in the movie, comes at the start when he gets set up by Solomon Lane. The other comes after six months in hiding, when he has gone full Unabomber and let himself–and his hair–go. Oof, that beard….that beard is not good. Hair is okay still though. Of course it is. In terms of his hair in individual movies, Rogue Nation is definitely the most interesting. Tom Cruise was 53 when that movie came out. Fifty-***ing-three! Style – Mission: Impossible III, but longer and more voluminous. He also tends to brush it up instead of across like he does in Ghost Protocol, and it looks more stately. But even with this style, he can comb his bangs straight down and it still works. Practicality – Once again Ethan has sacrificed versatility for the ability to naturally blend into a crowd. Upkeep – Oh he definitely has a regimen, and it’s totally worth it. How It Looks During The Movie’s Biggest Moments – Even for a Tom Cruise movie there’s a whole lot of running here. He also falls, climbs, and leaps across rooftops. The hair looks great not matter what. It also holds up well when fighting. This haircut can really do it all. Is this recency bias? No, it’s handsome bias. This is a perfect haircut and it will always be a perfect haircut no matter his age. How It Looks During The Movie’s Biggest Moments – Like literal magic. Fair. But please allow these images and clips as a counterpoint. Mission: Impossible II is definitly the worst film in the franchise, but Ethan Hunt’s hair never looked so good.